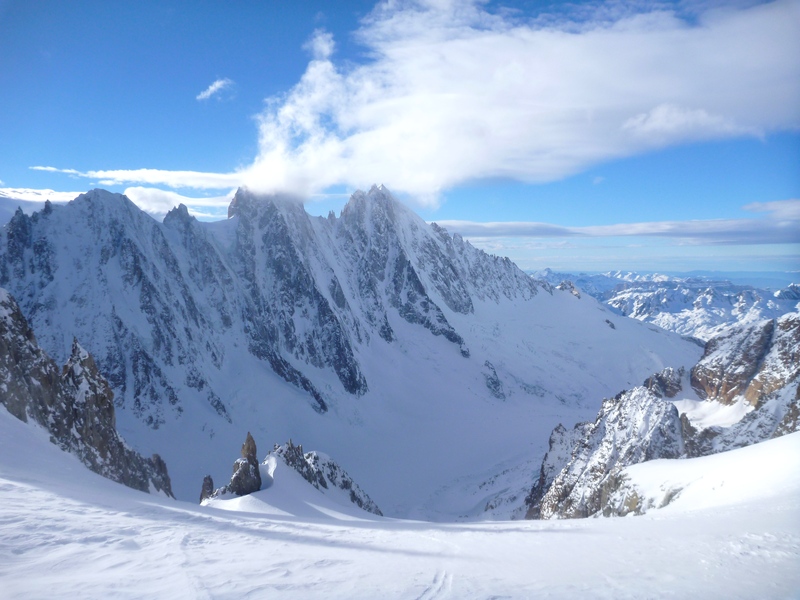 After the recent snowfall in Chamonix I was keen to get up skiing on Monday after finishing a weekend of work. 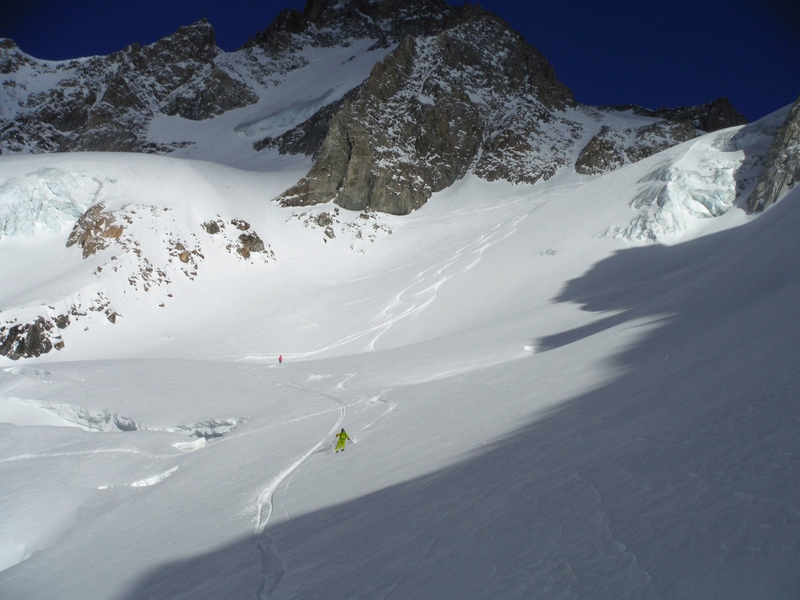 We rushed to the Hotel face at Brevent just to find some heavy untracked spring snow. Moving along the Aiguille Rouge towards Flegere we found more of the same. I knew I would have to go touring if I wanted to ski something nice. 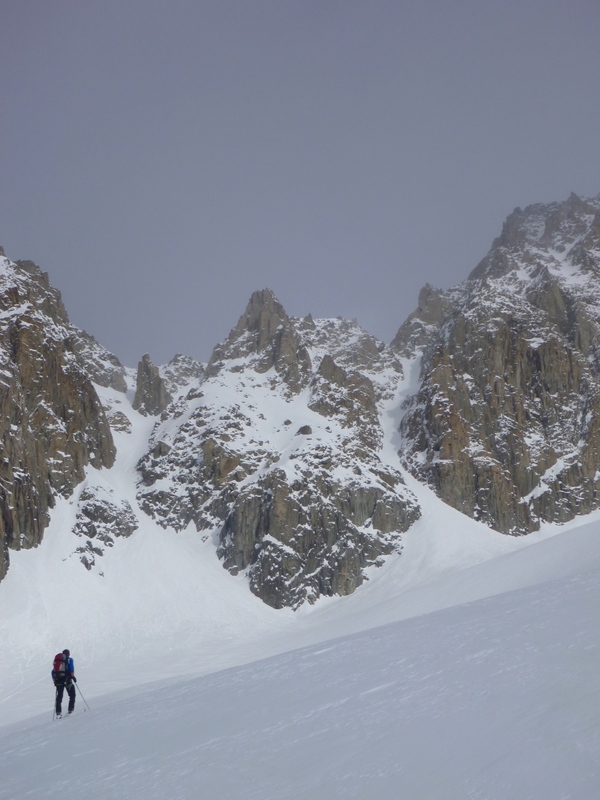 John Vincent and his friend Francesco were keen and had suggested the Col d’Argentiere, Not having done it before I was ready and because of its west facing aspect the snow had a better chance of being less affected and more stable. 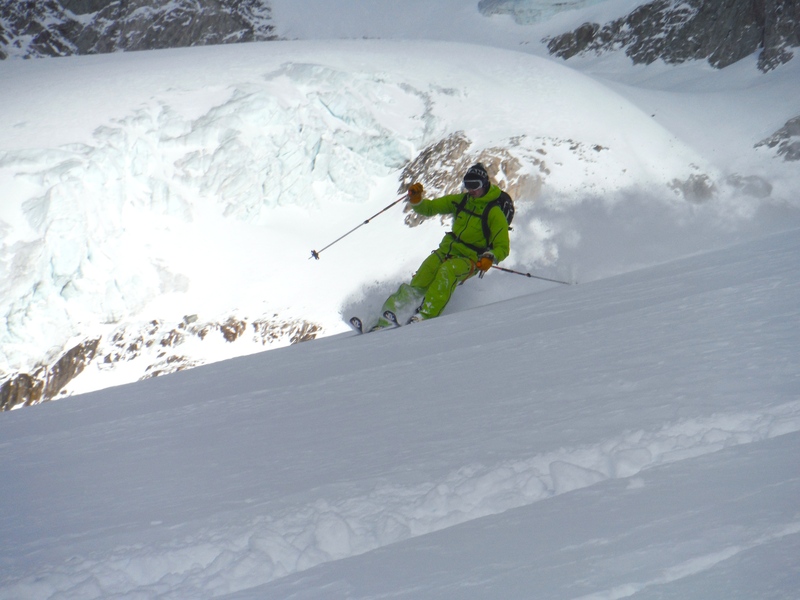 Jumping on an early bin at Grand Montets and meeting Francesco at the mid station after he opted to skin the homerun, we then took top ticket and skied down to the glacier. The snow of the back side was well tracked but still nice and cold. 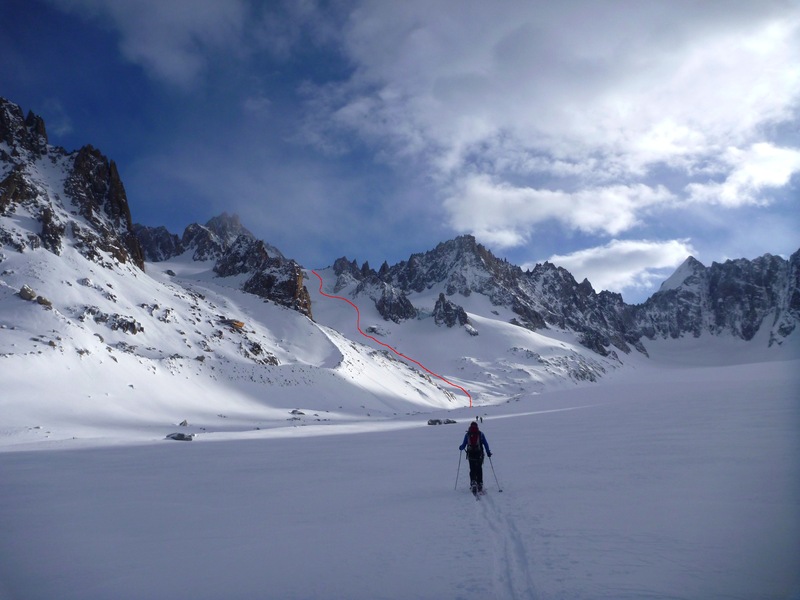 John heading to towards the Col d”argentiere, marked in red. The weather on tuesday was quite mild in the sun with some cloud passing over, when you hit the higher slopes it became windy and it was quite cold in the shade. 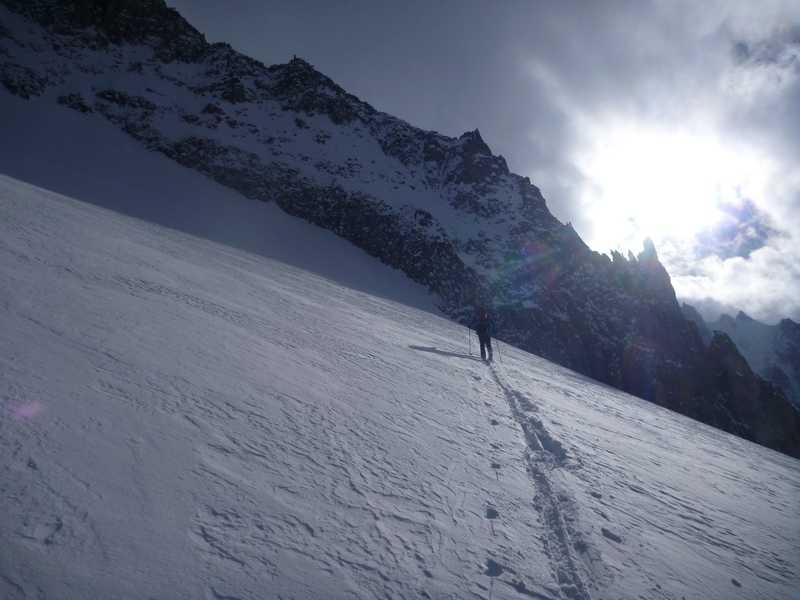 There was a track in across the glacier as many people had headed towards the Toir Noir and the right bank of the Col d’Argentiere so we made quick progress to the start of the climb. John set up the glacier first breaking trail through some boot deep powder and we followed up behind. 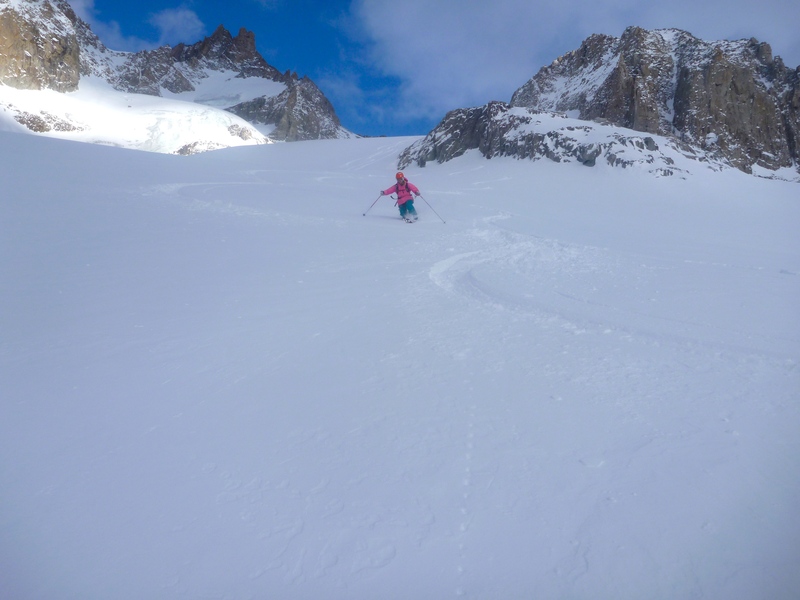 Just over half way up the glacier we noticed some nice looking couloirs off to the left so we decided to go and have a look at the snow conditions with the intention of skiing them. Skinning up to the narrow exit we then changed to boot pack and after about 1 meter of trying to climb the deep heavy snow we changed back to our original plan of the col! They are now on my tick list for the future. Back on track to the Col we topped out after a few hours on the move. 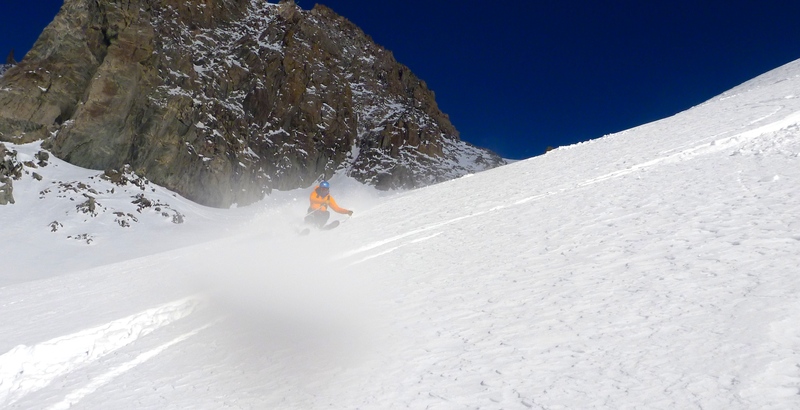 The wind on the Col was pretty strong and John was quick to help us get ready after sitting up there for 5/10 minutes alone. Skipping the summit lunch we headed down to find some shelter from the wind. 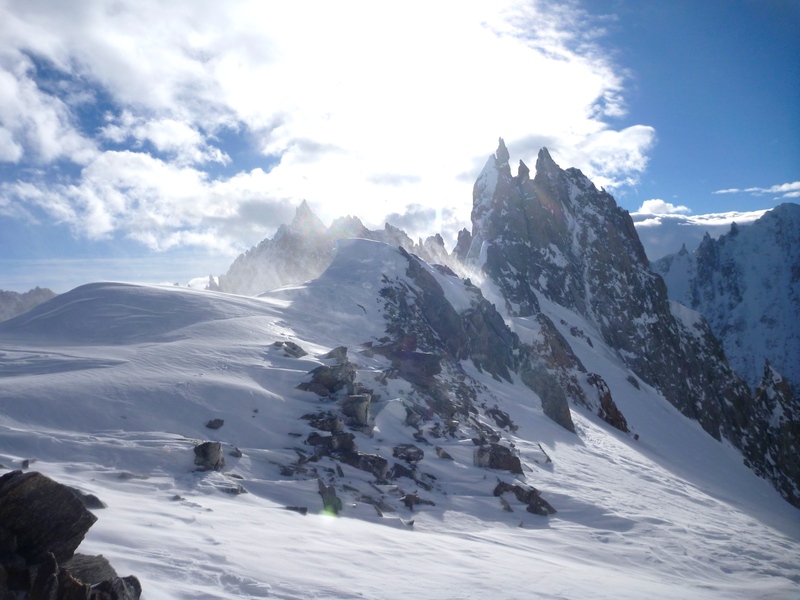 Looking back down the Col towards Aiguille Vert and the Argentiere basin. The decent was quite varied with the first 100m being very wind affected. 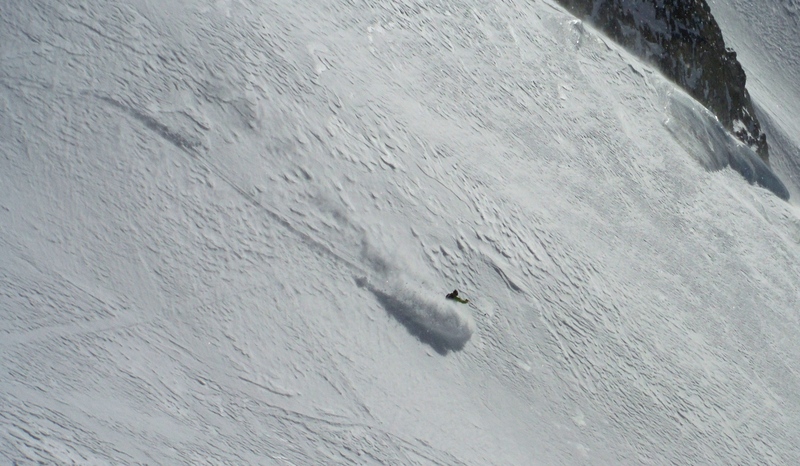 It then opened up into huge powder fields with only one track on, the skin track. The snow was firm but still deep and rip-able. One by one we enjoyed some big turns down the perfect angle slope. I opened it with no hesitation! John v photo. 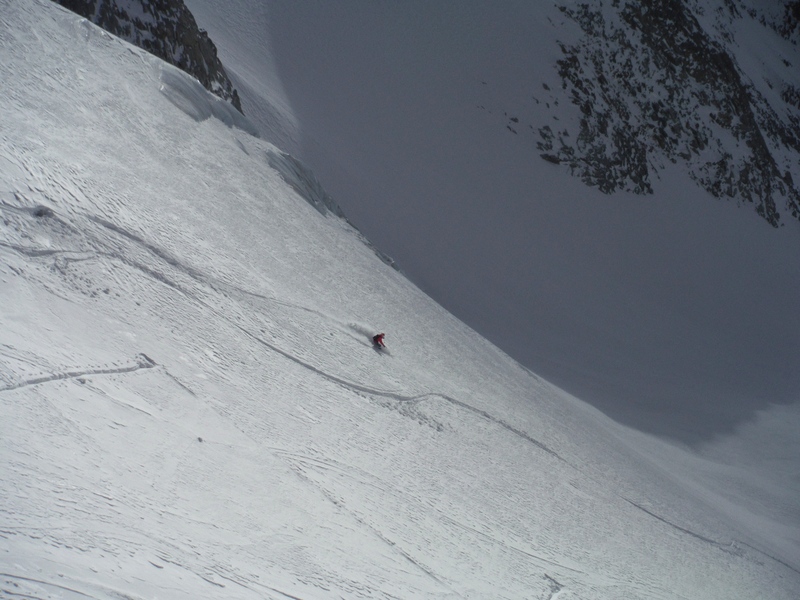 Francesco was next with some big Tele turns. The only photo I have of John and there was water on the lens! 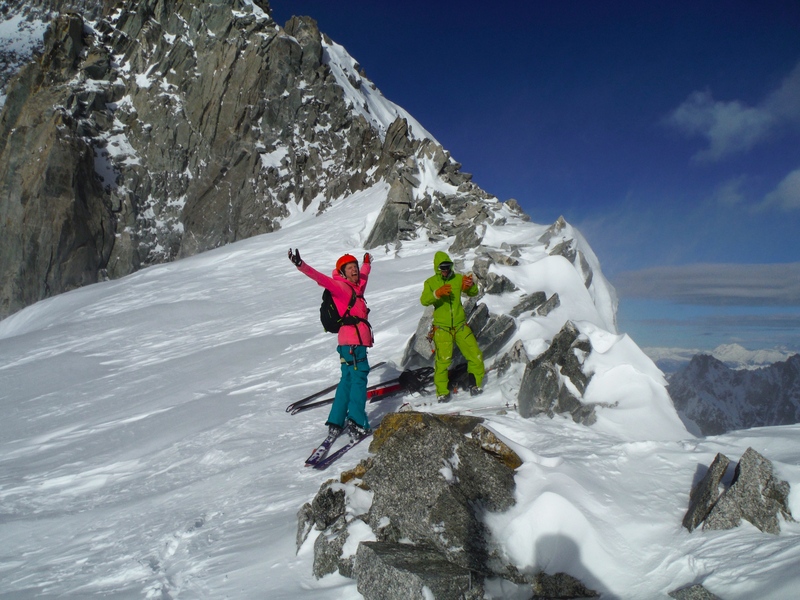 Half way down and there were only 3 tracks behind us, that doesn’t happen often in Chamonix! The lower slopes were a bit heavier but you were still able to open it up. Enjoying the moment, soft snow and smiles. Back down the glacier in about 20 minutes and we started the flat ski back to the mid station. after stopping for some lunch in the sun we had a quick blast down the home run to finnish a great day up the mountain with some superb skiing! Many thanks to John and Francesco for the photos and company.